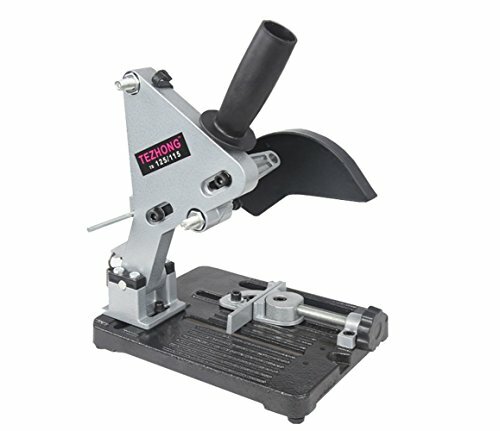 The DREALIN Grinder Holder securely holds your angle grinder for better control of the cutting wheel, essentially turning your grinder into a mini chop saw for precise cutting of pipe, rebar or tubing. Well Engineered: Nice adaptor for angle grinder（4"-4.5"）. It helps to make angle grinder into a metal cut-off tool. Great for small to medium cutting, Which it does well after you adjust the grinder to the holder. Well Constructed: Heavy-duty iron base, screws or bolts to a workbench or stand. It has a nice vise that can be angled. The stand is plenty solid, heavy enough to stay put, and all flat and square. The holder has its own guard, the guard helps to direct the steel shavings away from you. Aluminum body stand has a handle for better cutting control. Unfold L x W x H (in. ): 9.92 x 9.92 x 10.23, Max cutting depth: 11.8"
If you have any questions about this product by Drealin, contact us by completing and submitting the form below. If you are looking for a specif part number, please include it with your message.